The first case, known as Matter of L-E-A-, relates to when an asylum-seeker may establish persecution as a member of a family, and the second, called Matter of Castillo-Perez, relates to what types of criminal convictions disqualify an immigrant from other forms of deportation relief. The board's decisions in both of those cases are stayed pending Whitaker's decisions. It's worth noting, though, that none of Whitaker's predecessors could make the claim to immigration expertise either, including Loretta Lynch and Eric Holder during the Obama administration, even though they, too, certified cases to themselves from the BIA, although not at the rate Sessions did. Surely this lack of subject matter expertise is something that Chase, a former immigration judge (who styles himself "the Honorable" Jeff Chase in his blog, is an immigration attorney who represents aliens for a fee before the courts, and who is a volunteer advisor to the advocacy group Human Rights First) knows or should know. What's more relevant is what the immigration experts surrounding the AG think, and clearly they are concerned that the BIA is exercising a propensity toward expansive and erroneous interpretations of law, rather than simple statutory construction and application. 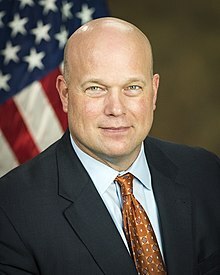 As for myself, I'm heartened by the attention Whitaker is showing. I pondered in a prior post departure would signal an abandonment of interest in immigration matters within the Justice Department, and Whitaker's certification of these cases for AG review is the right signal. My colleague Andrew Arthur (also a former immigration judge) wrote his own post on this topic, which I encourage readers to view. But what I really want to focus on is the last portion of Chase's remarks, to wit, "And, then there is the question of whether he really is the Acting Attorney General." This has to do with the statute under which the president chose to put Whitaker into the acting AG position instead of Rod Rosenstein, the deputy AG who might in other circumstances have moved up to the number-one position. I won't get into a discussion of the president's choice of statutes here, it's beyond my purview, but it's clear that advocacy groups are going to seize on that as a means to collaterally attack anything that Whitaker does in the immigration arena. Several immigrants rights organizations on Friday urged the U.S. Department of Justice to not allow acting U.S. Attorney General Matthew Whitaker to preside over a Board of Immigration Appeals case that his predecessor referred to himself for reviewing the so-called "duress defense" for suspected persecutors seeking asylum in the U.S.
Because President Donald Trump appointed Whitaker to replace former Attorney General Jeff Sessions without obtaining approval from the U.S. Senate, Whitaker lacks the legal authority to weigh in on whether individuals deemed to be persecutors may duck deportation by arguing they were under "duress" when they performed the actions at issue, according to the amicus brief filed by the American Immigration Council, the Northwest Immigrant Rights Project and other groups. "President Trump's designation of Mr. Whitaker as acting attorney general — the nation's highest law enforcement position — subverted fundamental constitutional checks and balances designed to safeguard our democracy," the amicus brief reads. "Because Mr. Whitaker's designation as acting attorney general is unlawful, he cannot preside over this case, or any other immigration matter referred to the attorney general." The idea that the Justice Department as an entity could forbid its boss, the acting AG, from ruling on a matter within his supervisory authority and jurisdiction is, of course, spurious and the organizations filing friend-of-the-court briefs know this. Instead, they are attempting to tee it, and other cases such as the two mentioned earlier, up for circuit court review on so-called constitutional grounds. This way, if the cases fall flat on merit in the circuit courts, they still get a shot at overturning anything Whitaker may decide that isn't to their liking, or at least tie up the courts, and therefore the cases, for an indefinite period of time. The particular case involving the persecutor, one Daniel Girmai Negusie, an Eritrean guard at a camp where egregious abuses took place, also is illustrative of the peculiarities and failings of our immigration system. First, there is the irony that a persecutor has so many advocacy organizations — organizations that purport to be in favor of human rights — fighting to keep him in the United States. Certainly there are questions worthy of confronting legally and morally, having to do with coercion and duress, but when all is said and done, the irony cannot be dismissed and, depending on the ultimate outcome, these self-same organizations may come to rue the forced opening of a broad-based duress defense to alien persecutors. It will inevitably generate endless further litigation in cases to come, many of which will involve horrific crimes against humanity. Second, Negusie's case tends to prove in fundamental ways that immigration litigation has become the playground of lawyers in which outcomes are less important than perpetual motion, like a Rube Goldberg machine. This case has already been to the BIA, the Fifth Circuit Court of Appeals, the Supreme Court, and back again. It has been churning around at various levels of the administrative expulsion and court systems for longer than a decade. It isn't hard at this juncture to envision Negusie's case being unresolved for another 10 years — particularly if the lawfare artists arguing that Whitaker's decision-making is unconstitutional gain a legal foothold. Negusie may very well be an old man by the time litigation finishes. How does this serve the American public or bestow confidence in either our immigration or our court systems? The Nuremberg trials took considerably less time with significantly greater stakes than Negusie's case will ever represent.